I also lengthened the sleeves about 1" after comparing the pattern piece to one of his dress shirts. When he tried it on before I attached the cuffs, I saw that he actually did not need any of the extra length, which is unfortunate because now he has extra-short plackets. He actually had me take 2" off the sleeve before attaching the cuff, effectively shortening the pattern 1". I didn't agree with this move, but he was firm, so I went along with his wishes. It was his birthday, after all. (Spoiler: After he'd worn it a day, he came back and told me that I had been right about the sleeve length ... ) For next time, I think shortening the sleeves for a total of 3/4" would be about right. I sewed the view with darts in back instead of a center pleat, and I think it looks really good on him! I made a stupid mistake while cutting my first sleeve, so I had no choice but to cut both sleeves on the crossgrain. I also was careful to match the plaid horizontally, but I made no effort whatsoever to match it up vertically because it made my brain hurt to try. I have much respect for those of you who are able to do that! To further ease the plaid matching and create interest, I cut the outer yoke and cuffs on the bias, cutting the inner yoke and cuffs on the straight grain for stability. I opted for the "soft" interfacing option, interfacing one collar stand, the upper collar, two cuff pieces and the left front placket. 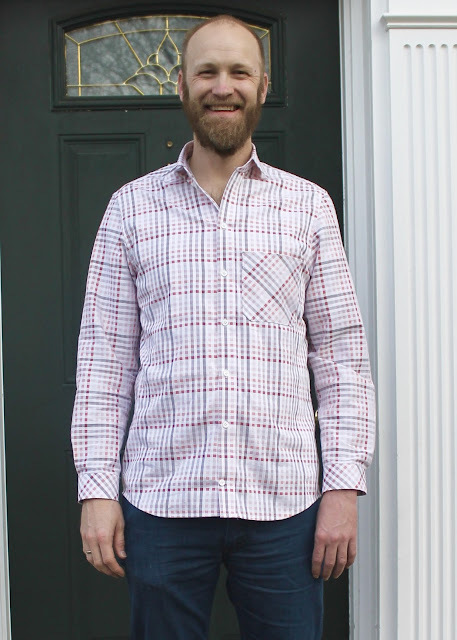 I finally placed an order with Fashion Sewing Supply, including a yard of their Pro-Woven "Shirt Crisp" Interfacing, and some of their shell buttons, both of which I used on this shirt. 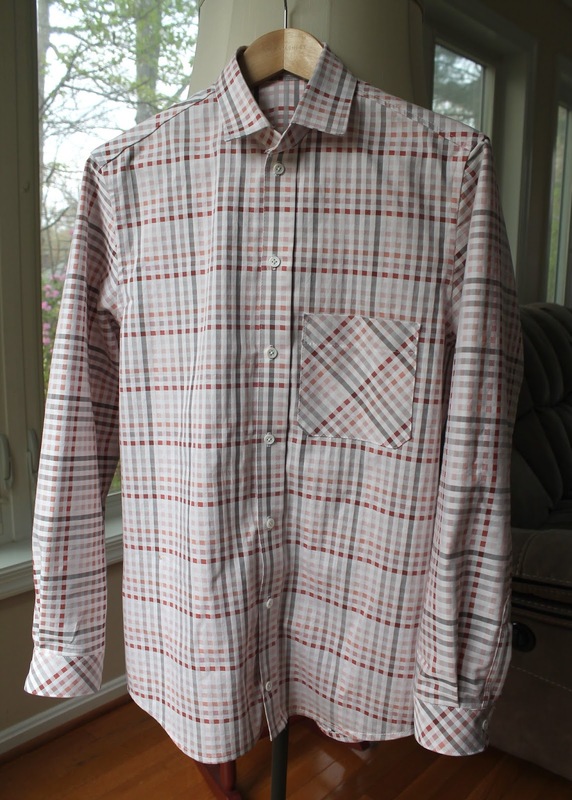 This interfacing is no joke; the interfaced parts are still quite crisp, even with just one layer of interfacing; they are actually even stiffer than some of his RTW dress shirts that he wears with suits. I don't think there is any need for me to double the interfacing when I'm using this brand. And I'm glad I finally made the break from Pellon. This shirt marked the first time I had sewn tower plackets. I had psyched myself out about it a little bit, having heard that they were so hard. I have to say that I didn't find it difficult, or time consuming at all. 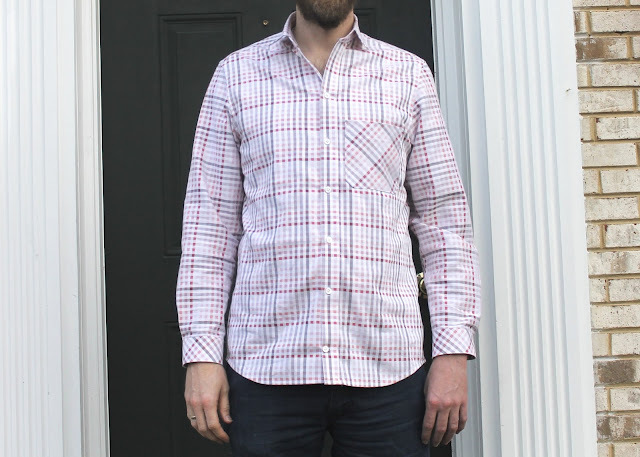 I have much more trouble with cut-in popover style plackets, of which I've sewn a few. My plackets aren't perfect, nor plaid-matched, but I'm proud of them. Of note, this is actually the wrong side of the fabric. 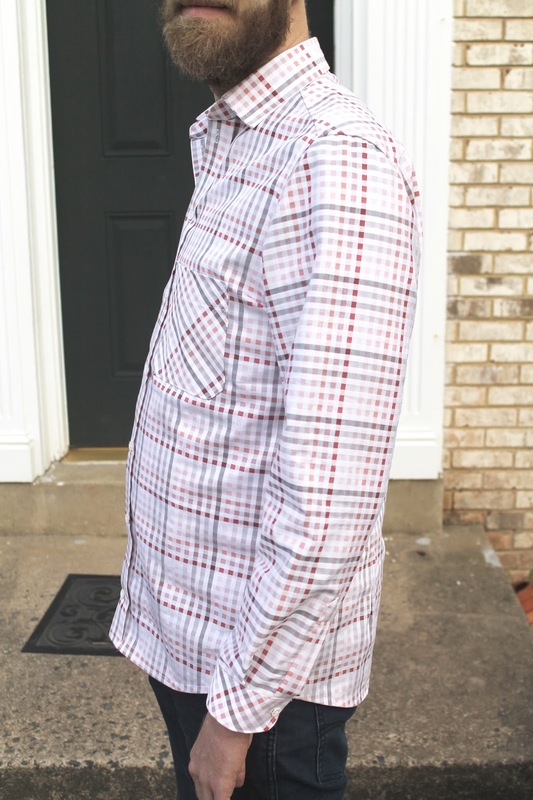 Both J and I preferred the more muted wrong side of this plaid. 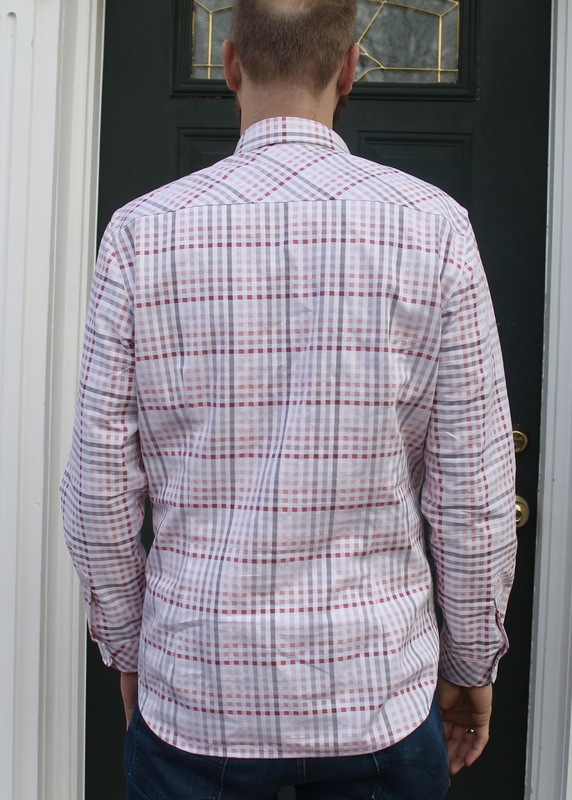 You can see a peek of the right side, with its dark gray lines, on the inside of the back yoke in the photo below. And it turns out, after all those months of procrastinating this project, that I really enjoyed sewing it. I took my time, working in half a dozen sessions over the course of 12 days: 1) Cutting. 2) Interfacing and sewing the front plackets. 3) Assembling the yoke and sewing the shoulder seams. 3) Putting on the sleeves. 4) Collar and side seams. 5) Cuffs and hem. 6) Buttonholes and buttons. This bodes very well for the second cut of shirting J picked out at Mood. So sure was I that I would hate sewing this shirt, that I had already thought of stealing his second choice cut for myself. But I see a lot of shirts in his future now, and I feel like I've definitely leveled-up my sewing with this project. that looks great, and your plaid matching is perfection. Nicely done! So many great details on this make. I always find it satisfying when I "get" something new. Thanks! It's definitely invigorated my sewing. 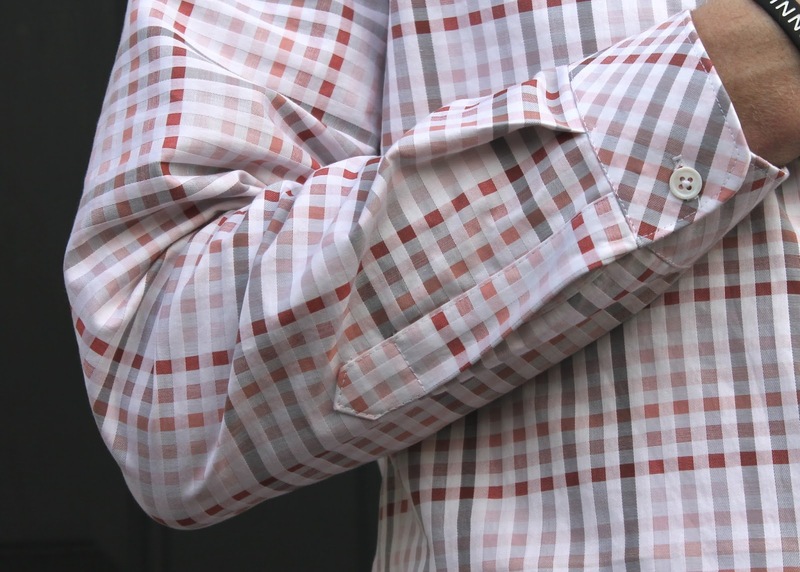 Great shirt and love your fabric - always a challenge to find nice fabric for the men in our lives. Yes, I agree! I wasn't totally sold on this fabric but I'm glad we got it. The shirt looks excellent and your husband looks very happy. I’d say it’s a win all the way around! Looks fabulous. I have to tell you I really enjoy reading your blog.You always explain why you do something and I find it very helpful. You are definitely an Asset to our Sewing community. I've been seeing for 40 years and I always learn something new every time I read your blog. So Thank You for your great blog. Looking forward to next time. You are very kind! Glad you are enjoying the blog! Wonderful work! 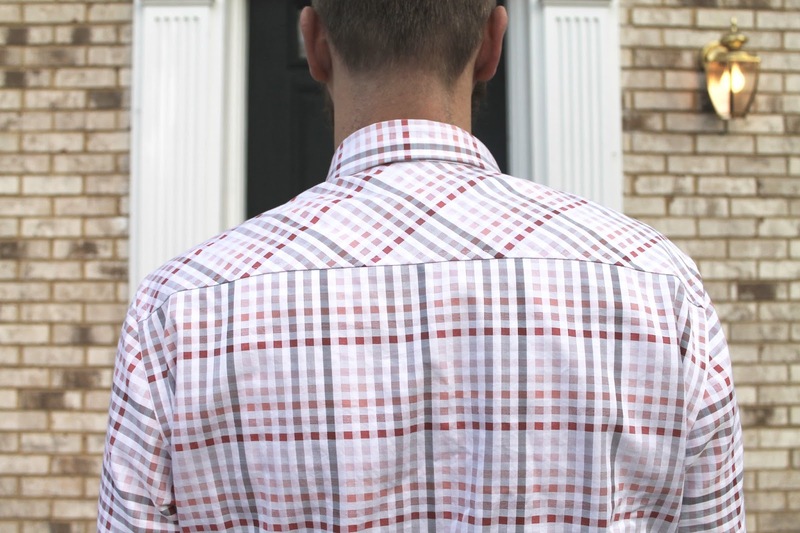 You and J have a knack for choosing fabric, that is quite a handsome plaid! Your plackets made me happy. wow...that looks like it was bought at Neiman Marcus! This is an excellent shirt! I was chuckling about the tower plackets. Woman, you have sewn jeans. You do not need to be intimidated by a mere tower placket! I actually find them quite easy to do, I agree, they tend to be lower stress than neckline plackets.